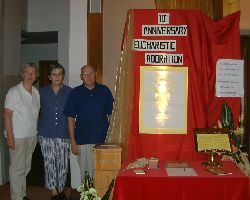 Saturday 11th is the 10th Anniversary of Perpetual Eucharistic Adoration in our parish. To mark this occasion, Mass will be celebrated in the Church of the Assumption on Friday 10th at 7.30pm. All are welcome. Over the weekend, a visual display to focus our attention on this special occasion can be seen on the Chapel Street side of the Altar. Perpetual Eucharistic Adoration is a lay Apostolate, and people who take part in it , belong to a world-wide Eucharistic Adoration Apostolate, which was formally approved by the Holy See on June 2nd 1991. 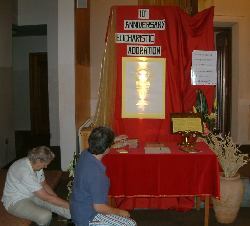 In Ireland the Apostolate is in existence since 1987 and is established in each diocese. There are more than 250 parish centres of Adoration throughout the country and more are being added by the grace of God, on an ongoing basis. family commitments, illness or death.